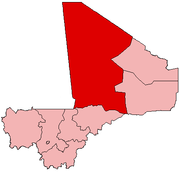 Kaneye is a village and commune of the Cercle of Goudam in the Tombouctou Region of Mali. As of 1998 the commune had a population of 2,418. ^ "Previsions de desserte des communes pour la periode de 2001-2005" (PDF). Mali Reforme Telecom. Archived from the original (PDF) on August 29, 2004. Retrieved February 23, 2009. This page was last edited on 10 June 2017, at 08:42 (UTC).